Cat mongetes, L. Phaseolus vulgus, Ar. lūbya, Eng. 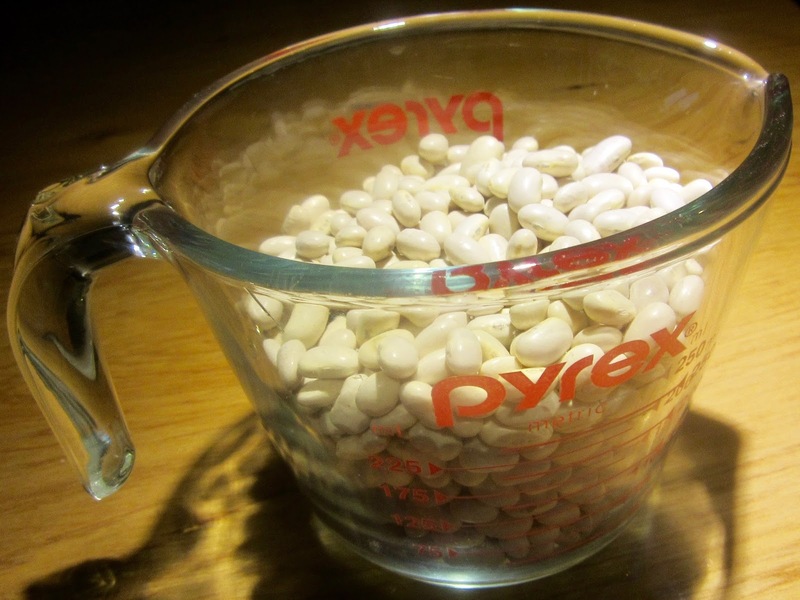 a local variety of white haricot beans. Those from Bages, a region in Catalonia, are particularly famous. In this province these beans normally are accompanied by butifarra. It is thought that mongetes or what came to be known as haircot beans in the 16th C were used in Spanish stews prior to the introduction of American broad beans and others. It has been debated whether “haricot” is derived a word in old French meaning stew or from Aztec ayacotl. In 12th C in al-Andalus, Ibn al-‘Awwam describes 17 bean varieties. In fact the Spanish word for broad been is derived from the Ar. al-lubiya, indicating that not all members of the Phaseolus family are from America. One of the several varieties described by the Hispano Muslim could be the haricot. The bean originated in Afganistan and the Himalayan foothills making it very likely that the Muslims brought it to Spain. Medieval Islamic recipes calling for them have been discovered. It has been observed also that Europe was relatively poor in legumes prior to the discovery of America, while Hispanos were receptive to new Muslim products and foods. Taking into account the protein, iron, calcium and other contents of haricot beans over bread and lard, the medieval European stable, it has been surmised that the Hispano Muslim diet improved productivity, which in turn contributed to the Andalusian economy and the flowering of al-Andalus. See haba and judia careta. Wash beans. Put them in a large bowl sprinkle soda over beans and cover with water. Let soak overnight or at least 6 hours. The following day, rinse beans and put them in a pot or pressure cooker with the carrot and murri. Cover with water. Bring to a boil and reduce heat to gently boil for any where from ½ hr – 3 hrs depending if using a pressure cooker or pot and the quality of the beans. After about hour, remove carrot from pot. Slice and set aside. At the end of cooking time for the beans, add salt to taste. Cut 1 strip of lard into bite size pieces. Fry them. When browned remove from heat and add 1 whole link of butifarra and/or any other sausage to accompany the beans. 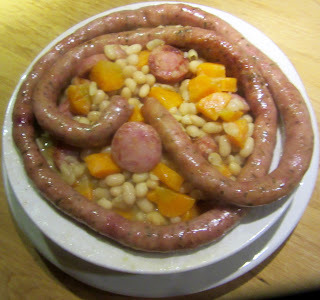 Mix beans with sliced carrot, lard and sausages other then butifarra. Pour this into a serving dish. Add enough juice from boiling to make soppes. Take the link of butifarra and circle it around the dish. Serve with allioli in a separate dish. A Catalan reknown white sausage. See blog titled allioli published April 4, 2016 for recipe.